Even if your cat has never stayed in a cat hotel around other cats we recommend they try one of our Group Play Rooms. We have two spacious Group Settings. They receive most of their light naturally from skylights. There are lots of places to climb, run or lie quietly in the sun. Drop by for a tour any time you like or look around on our controllable web cameras. We are converting to infra-red cameras so you can see our feline guests day or night. There is something retro in this in that they display only in black and white, so you won't see the sumptuous hues surrounding our guests. We thought you would prefer to share cats' night vision. The rate is $41 per day for one cat including 1 meal of canned and unlimited dry house feline fare. Group Play Room discounts are available for multiple cats and pre-booked stays of 28 days. Cats are required to be current on their FVRCP vaccine and have a negative result of a FIV/FeLV blood test within 12 months. 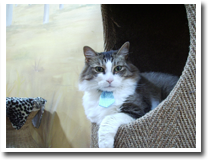 WE PREFER that ALL CATS boarding in GROUP PLAYROOMS receive the FeLV vaccine, but because of the sarcoma risk we do not require it. We leave that choice to be decided between owners and their veterinarians. Click HERE to download our test/vaccine requirements sheet. We require prepayment at the time of drop off. Our sunniest and liveliest Tahiti Beach will transport your cat to the South Pacific. There are two 6 foot tall carpeted palm trees with coconut bowls for curling up, a giant clam shell next to the treasure chest and little wicker baskets all around. Our 30 square foot skylight tracks sun across the room and you can watch the kitties sunning themselves. The Kings and Queens of the jungle rule here. Your cats love the "wild life", so give it to them here! Our African Savannah is reserved for indoor-only or shy group cats. 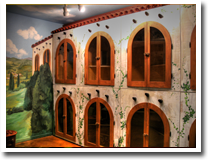 We recommend this Goup Play Room for cats who tend to give and want more space. It's a great way to introduce your cat to Cage Free Cat Boarding. 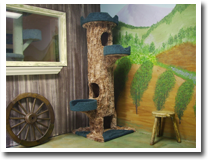 The climbing, tunneling and hiding features include a 9 foot cat tree, wicker furniture and fun tubes, provided so cats can choose in lots of room to romp, relax or retire for a nap. For cats who can't interact with other cats we have Private Condos and VIP Suites available. We can link Condos together, depending upon the space available, to give your cat, or cats, more space. 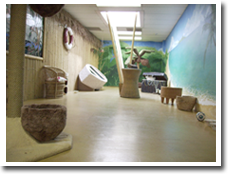 Our Private Condo Play Area is exclusive for each condo, or linked set, in turn during the day for cats that have a negative result for FeLV/FIV blood test in past 12 months like the group play cats. Each negative tested cat spends part of the day inside the Private Condo and part open onto the exclusive play area. Cats in our Private Condos and VIP Suites never come into contact with cats outside their family. 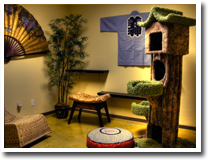 Our VIP Suites are walk-in rooms where your cat, or cats, can stretch out with no other cats around. This is the ultimate in Cage Free Cat Boarding. They are quiet and tranquil and perfect for special needs kitties. The very best in luxury cat boarding is now available to owners who don't want their cats to mix with other cats. A current FVRCP vaccine is required for all our guests including all those in our Private accommodations: the Private Condos and VIP Suites. Click HERE to download our test/vaccine requirements sheet. The Private Condo rate is $47 per night for one cat. 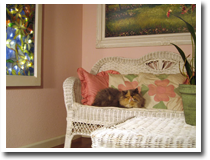 The VIP Suite Rates come in $70 per night and $100 per night options, for one cat and 30 for each additional cat. Private Condo discounts are available for multiple cats. Discounts are available to all our guests for pre-booked stays of 28 days, with pre-payment at time off. Rates increase during peak periods, described on our contact page. Please feel free to call us, (818) 845-2287, or email us, Burbank@BestLittleCatHouse.com, for personal service. We require prepayment at the time of drop off. 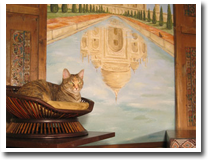 Your cat, or family of cats, in seclusion, will bask in the luxurious splendor of this monument to love, the Taj Mahal and its reflecting pool! family has a warm spot to curl up for the ultimate in cottage contentment! Fields of lavender surround row upon row of grape vines with a view of the British Isles across the Channel. Will your chat, or famille de chats, reconnoiter this Frech barnyard playgound? Oui, merci! The warm earthy tones of our countryside Tuscan Villa remind us of wine, sun soaked hills and colorful locals. Each Private Condo or linked set opens in its turn during the day onto the inviting exclusive fields, so its cat, or cats, can run and romp in private. Flavors of the far East beckon. You can almost hear the resonance of Koto strings. All the cats that stay in our Japan room are Super Lucky Cats!